New Man Utd Signing Not Good Enough For Reserves? BEBE, who Man Utd signed for £7m despite Alex Ferguson never having seen him play, is playing so badly in training that he was withdrawn from United’s reserves last night – so says the Mirror. Oops – I guess that can happen when you sign a player you know almost nothing about. It’s been reported that Bebe’s first touch and close control are not up to the standard required by United. You could have said that about Darren Fletcher when he started out at Old Trafford, mind. Yeah, so, um… hands up if you saw this coming? In fairness to the player, to make the move from Vitoria Guimaraes to one of the biggest clubs in the world must be extremely daunting, and I imagine he’s so overawed that he’s not doing himself justice. Who is the cute little lesbian, second from the left???? I don’t give a damn what some idiotic Anti-United chelsea loving media thinks, Bebe has only just arrived and needs to adjust to a new life aswell learn the language. the press just continues to embarrass itself with the ABU propaganda ad needs to grow up, Bebe only been here 2 weeks and needs time, I doubt he was even going to play and that the media are just making up crap so once again they can attack the worlds biggest club Manchester United and our players. Bebe will be a star in the future. But have you got her phone number???? Give the lad a chance to settle in, I’m guessing he’s not had exactly world-class coaching so far. I don’t think the last couple summer signings of Manchester Utd have made any improvement to the club at all. Infact, they are going backwards comparing to the last 3 seasons when Ronaldo and Tevez were still playing in the side. United lose TOP-CLASS PLAYERS but bring in just FINE PLAYERS. I also believe that the scout of Man.Utd. are not producing any effiency of work in the transfer market at all. The money spent this summer for all 3 players are nearly 30 million pounds, which I can’t see any value from them at all. There is no top class player but WHY??? Why United spend their limited amount of money like this??? 7m for that dude,sure its still early to predict what will hapen but with 7m i think they could have bought M.berg or O.toivonen,good quality forwards…i personally think he should take panalty kicks,he will stare the keeper shitless….. I agree entirely with Gazzaro. Ollie, I did read the whole thing and wasn’t refering to you but the papers. Bebe is gonna be a great player……….Gazzaro, and that is why it is a good thing fans like you have no say as you show how clueless you truly are, Sir Alex, our scouts and Manchester United knows what they are doing and knows more than you will ever know. 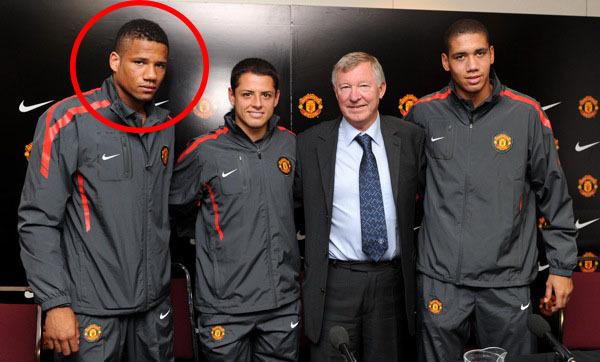 Sir Alex does it again with great young buys in £10m Smalling, £6m superstar Chicharito and £7.4m Bebe, plenty of value here and three talented futures of our club. In the last 6-7 seasons, if I’m right, the only player that United made a really great signing is C.Ronaldo which infact we did signed him because he played very well in a friendly match and United players at that time (lead by Keano) told SAF to sign him. Apart from that, Evra and Vidic are good signings. The others, however, they are just FAIR or FAIL!! !